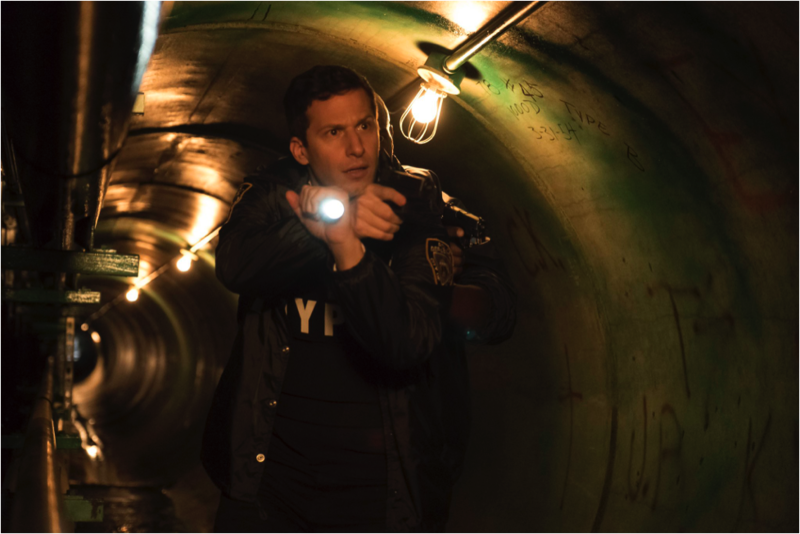 A special hour-long winter finale of Brooklyn Nine-Nine to ring in the New Year? Yes, please! A prison van transporting a group of nine convicts crashes in the streets of Brooklyn and all the prisoners escape. One of the only witnesses is former NFL running back Marshawn Lynch (guest starring as himself). Captain Holt alerts the team to the situation. Amy and Jake — who have been planning to move in together for a while but can’t decide which apartment is better (Amy’s, obviously) — decide that whichever one of them recaptures the most convicts gets to keep their apartment, and the loser will have to move in with the winner. Terry is paired with Jake and Amy is paired with Boyle on the task. They head out to the streets to hunt down the convicts. It seems both Jake and Amy ended up paired with the perfect people to help them. Terry laments having to give up his own space when he moved in with his wife and is ready to help Jake fight to keep his apartment. Boyle, on the other hand, has been dreaming of Jake moving in with Amy ever since they started dating. Amy’s apartment is only two blocks from Boyle’s so he and Jake would be neighbors. Back at the precinct, Gina’s been assigned to answering the tip line and Rosa will be interviewing the two witnesses. When Rosa finds out that one of the witnesses is Marshawn Lynch, she’s super excited, stating he’s one of her heroes. Holt, who doesn’t follow football, has no idea who he is. Rosa explains that Lynch used to always get fined for refusing to talk to the press so they probably won’t be able to get anything out of him. But when he arrives he turns out to be extremely talkative. Even though he didn’t see anything, he is more than willing to regale them with an in-depth analysis of the quesadilla he’d just bought and his love for cheese. Rosa is disappointed to find out that her hero is so friendly and likable. Meanwhile, Terry and Jake manage to catch one convict and bring him back to the station. Proud of themselves, they assume they recaptured the very first one, but quickly find out Boyle and Amy are way ahead of them, having already brought in three convicts. Amy reminds Jake that she and Boyle only need to recapture two more convicts in order to win the bet. While Jake, Terry, Boyle, and Amy head back out, Rosa and Holt try to interview the other witness but she doesn’t speak English. Holt whips out a map of the world (which he carries on him at all times, naturally) to find out where she’s from so they can get an interpreter. She can’t figure out what they’re asking her, however. They then try having her draw what she saw but that doesn’t work either as she keeps drawing what looks like either a pizza or a cookie or, as Hitchcock and Scully declare, a pizza cookie. Back on the streets, Amy and Boyle chase a suspect through an abandoned warehouse, only to find Terry and Jake arresting him outside. In an effort to win the bet, Jake and Terry paid a visit to homeland security and borrowed a fancy prisoner transport bus and a drone to help them capture the criminals. Jake informs Boyle and Amy that, with the help of their nifty bus, they’ve re-captured three more criminals (including the one they stole out from under them), plus the one from earlier, for a total of four. They’re now one ahead of Amy and Boyle, with only two convicts left to catch. They all head out and Jake and Terry soon track one of the remaining prisoners to a building with 30 floors. If they can catch this one, they’ll have five convicts and will have won the bet. With their fancy homeland security bus, they can tap into all of the security cameras in the building. While Jake mans the cameras, Terry goes in, directed by Jake. Unfortunately, there’s a room not on the security feed and when Terry enters, he’s captured by the convict. Jake rushes in to assist and tries out his negotiating skills (which could use some work). While he attempts to reason with the prisoner, Amy appears out of nowhere and hits the convict over the head, knocking him down, and capturing him for Team Amy and Boyle. The teams are now tied with four convicts each, and one last convict to capture. Meanwhile, Gina’s tip line has paid off... or has it? She presents Holt and Rosa with a very normal-looking gentleman who called in claiming to have seen something. However, when he begins talking, it’s all about lizard people living under the city and controlling their minds. Holt declares him a wackadoodle and goes back to trying to interpret the other witness’s drawings. Then, something the lizard man said clicks — he mentioned seeing one of the lizard people slip into an underground hole to his lair and the witness’s pizza cookie drawing looks an awful lot like a manhole cover. Holt deduces that the last of the convicts escaped into the sewers. Both teams head out to investigate and manage to corner the last convict together. As both Amy and Jake rush to read him his rights the fastest, Jake suddenly stops and declares Amy the winner. When she asks why, he says he just realized how much he loves her, how awesome she is, and also, that her apartment is way better than his. It’s not quite a happy ending yet, however. Boyle quickly discovers that the man they just captured is NOT one of the escaped convicts. He was one of the prison van drivers and was being blackmailed to help the remaining convict escape. The convict had threatened to murder his family if he didn’t crash the van and then switch clothes with him. The teams regroup at the precinct, where Holt informs them the last prisoner, dressed as the security officer, was taken to the hospital and then escaped from there. Rosa’s gathered background information to assist them in capturing the final convict, who as it turns out, is the very worst of the bunch. His name is George Judy and he’s been in and out of the system since the age of 11, has numerous aliases, and has murdered five people that they know of. While Jake’s reviewing the info, he makes a connection: the perp was in foster care with someone well-known to the team: Doug Judy, better known as The Pontiac Bandit. Jake puts out the word that he needs to talk to Doug about his foster brother and is able to schedule a meet. Doug is eager to help. He hates his foster brother, George, because he did horrible things like steal from their mom, burn their house down, and steal Doug’s favorite vinyl record. Jake, in his haste to catch the bad guy, grants Doug full immunity for his help, which leaves Holt outraged. After all, The Pontiac Bandit has committed over 600 crimes for which Jake has now promised forgiveness. But, as Jake explains to Holt, Doug only gets immunity if he’s able to help bring down his brother, who by all standards, is a much scarier criminal. With no other options, Holt begrudgingly agrees. Meanwhile, Boyle has just uncovered a conspiracy. He found Hitchcock’s phone in the bathroom and discovered that there are dozens of text chains between the rest of the team, but he has not been included in any of them. Amy admits that he was left off the group texts because he’s an over-texter. Gina offers evidence, reminding him of the time he sent 97 texts to them all in a five-minute period. Boyle is still horribly offended and storms out. Jake and Doug Judy have managed to track down a lead. They’ve heard from one of Doug’s associates that George has been asking around about an art auction. Apparently, there’s a giant, bejeweled egg worth $20 million on auction there. Holt, who doesn’t trust Doug, assigns himself to the case as well, and all three of them head out to the swanky art auction. George, however, never shows. But while Holt, Jake, and Doug are inside, someone manages to steal all of the cars that were in valet parking. Holt, who drove there in his prized vintage car named Gertie, is devastated. Doug looks over the list of stolen cars and points out a vintage Cobra worth over $1 million that he’s sure must have been the one George was after. Holt, however, is unconvinced. After all, Doug — The Pontiac Bandit — is a known car thief while his brother, George, isn’t known for that particular crime. Doug is insulted that Holt suspects him, saying if he was going to steal a bunch of cars, he wouldn’t do it in front of two of New York’s best detectives. Jake defends Doug and convinces Holt he’s innocent and is the best person to help them track down his brother. Amy and Gina, meanwhile, have decided to start a group text that includes Boyle. Gina was against it, but Amy convinced her it would be okay. They quickly regret it, however, as Boyle immediately starts texting them way too much. They sit him down, armed with a presentation on better texting skills in the hopes of training him. Meanwhile, Doug Judy takes Jake and Holt, who are posing as undercover car buyers, to look for the stolen vehicles and track down his brother. They visit a chop shop and Holt quickly spots Gertie, who is being dismantled for parts. The mechanic informs them that George did drop off a few cars but not the Cobra. While Holt steps outside to quietly mourn the loss of Gertie, he spots George around back with the Cobra. He runs back in to get Jake and they try to take down George. Unfortunately, he races off down the back alley and Doug appears with a getaway vehicle. Both Judys drive off, leaving Holt and Jake in the dust. Jake laments being betrayed by Doug but is able to track him down quickly with the Find My Friends app. He and Holt rush in to find Doug and George waiting for them, guns drawn. Doug says some mean things about Jake, leaving him even more devastated, and then instructs his brother to shoot him. It seems, however, that Doug gave his brother an unloaded gun. Doug then knocks his brother out. Turns out he didn’t betray them after all. Doug gets his immunity and an apology from Holt. And Holt gets something in return: Doug found a Gertie look-a-like and bought it for Holt. While Holt inspects his new car and Jake and Doug say their goodbyes, Amy and Gina congratulate Boyle on passing their final texting exam. He’s now ready to rejoin the group text. As they leave the precinct, he tells them he’s going to send a text now and they say he’s ready. Gina waves goodbye and crosses the street as he presses send. She stops in the middle of the street to look at the text and gives him a thumbs up, telling him he did a good job, when suddenly she’s struck by a bus. The winter finale ends with “to be continued,” and we’ll be wondering for weeks whether Gina survived or not!